Learn how to do a fabric bleed test before using unwashed fabrics in a quilt. 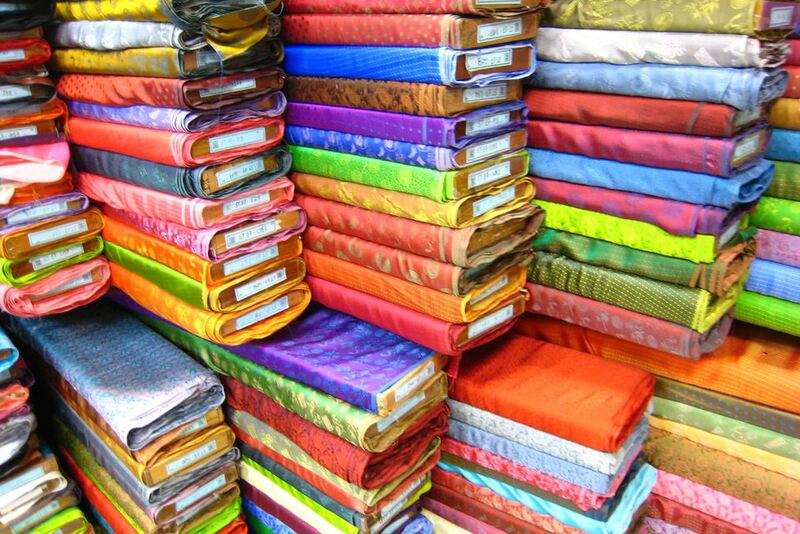 Some fabrics bleed (lose their dyes) when washed, especially vividly colored fabrics such as reds and purples, although bleeding can occur with any fabric. Fabric bleeding becomes a problem when the loose dyes stain other fabrics, even if they do not deposit colors onto other items in the wash. Some fabrics might bleed just enough for patches in quilt blocks that have been sewn together to stain adjacent patches, a problem that's most often seen when the quilt remains wet for an extended period of time. The solution to those problems is to perform an easy fabric bleed test if you suspect that a fabric's dyes might be unstable. Submerge a small piece of a fabric in soapy water -- a 2-inch square is fine. Use the same soap and water temperature you normally use to wash fabrics and quilts. Let the fabric sit in the soapy solution for about 30 minutes, then check to see if the water is discolored. If it is, the fabric bleeds and the dyes could potentially damage other fabrics. If the water is clear, try one more thing to make sure the dyes won't transfer onto adjacent fabrics when wet. Remove the patch and, without rinsing, place it on a white paper towel. Wait a bit and check to see if dye has transferred onto the toweling. If the paper towel is stained, chances are good that the dye will transfer onto adjacent fabrics when your quilt is washed. Rinse out the soap and dry your test patch. Perform the bleed test again. If bleeding continues, do not use the fabric in your quilts. If fabric bleeding stops, be sure to pre-wash the tested fabric a couple of times before use. If you must use a fabric that bleeds or transfers, purchase a commercial dye fixative, such as Retayne, to help make the dyes more permanent. Treat a snip of fabric, following the instructions carefully, then try the bleed test again. A product called Synthrapol is sold by companies that carry fabric dyeing supplies. It helps keep colors suspended in the wash, preventing them from staining other fabrics. Some quilters use a product called Color Catcher®, which resembles dryer softener sheets. Just toss one of the 'catchers' into the wash, where it absorbs loose dyes. Most fabrics produced by companies that cater to quilters do not bleed, but it's a good idea to do a bleed test on all vivid fabrics until you have a good understanding of which fabrics you can trust. Hand dyed fabrics should always be tested and pre-washed. Yes, the people who crafted those fabrics may have already taken steps to be sure their fabrics are stable, but it's best to be sure before you use handcrafted fabrics in a quilt. Crocking occurs when the excess dye on the surface of dry fabrics rubs off onto another dry fabric. Prewashing your fabrics helps avoid crocking. Some quilters never prewash fabrics. They prefer to wash a quilt after it is assembled. Once you're familiar with fabric types and brands, you might decide to do the same. Do a burn test to help identify fabrics. Learn how to make your own laundry detergent. Learn the best ways to store your quilts to avoid permanent creases and color transfer.